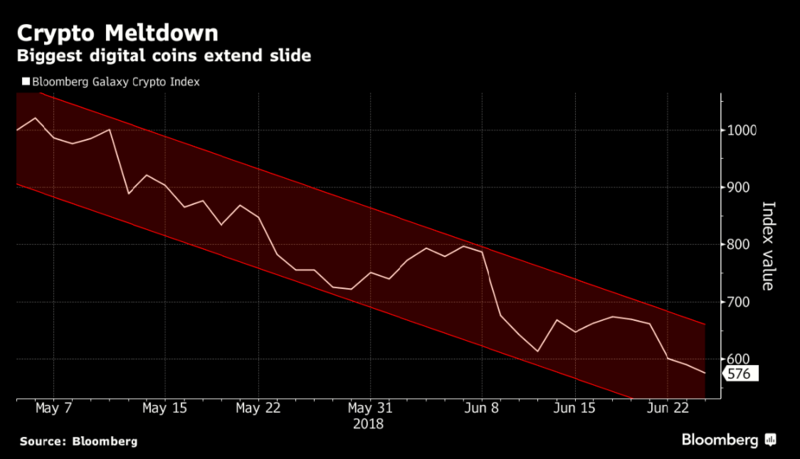 The meltdown in Bitcoin is weighing on more than the biggest cryptocurrency. Over 80 percent of 1,586 digital coins Finder.com tracks in a weekly survey decreased in price in the past seven days. The tokens fell 19 percent on average, Finder.com found in the week ended June 25. Trading volume dropped as well, declining by 6 percent from the previous week, Finder.com said. Bitcoin, Tether, Ether, EOS and Bitcoin Cash were the top five traded cryptocurrencies. Volume was half of what it was at the end of April, when Finder.com first started releasing its Weekly Coin Analysis.